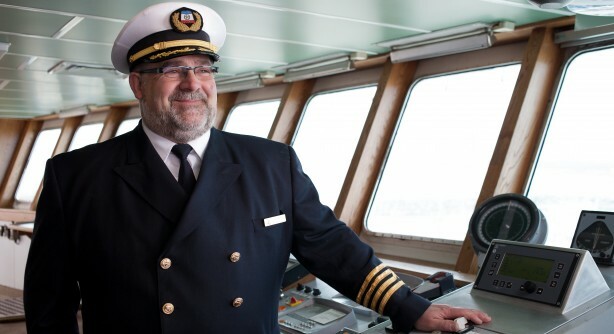 Captain Bernard Langford has been sailing the Gulf of St. Lawrence for more than 33 years. The CTMA Vacancier has been his pride and joy since 2002. The cruise ship can carry up to 450 passengers to a marvelous discovery of Les Îles de la Madeleine. Captain Langford is master aboard the archipelago's 8th island! Much like his ship, the man is larger than life! He is sturdy and unflappable. He fully assumes the responsibility for his passengers, his crew and his ship. A ship that is practically a 8th island of the archipelago. As soon as it leaves port, the whole ship seems to tune into the rhythm of life of Les Îles de la Madeleine. "On Les Îles, time does not belong to a clock. Time belongs to you." As a teenager, Bernard Langford already knew in his own heart that he would become a ship's captain. He was born with sea water running through his veins. He is the son of a fisherman, the grandson of a shipbuilder and a descendant of shipwrecked seafarers. The sea was Captain Langford's destiny. He says that he knows no greater joy than weighing anchor, heading for the open sea and setting the ship's course on the deep blue expanse. Absolute freedom! This sea captain is also a farmer who raises young beef cattle. Bernard Langford sees no contradiction in this. On the contrary, like his Madelinot ancestors, Captain Langford devotes his life in equal parts to the sea and to the land. Each deserves and each receives equal measures of his respectful care and harmonious attention. On Les Îles, time does not belong to a clock. Time belongs to you. This captain's appreciation for the Madelinot lifestyle and pacing has not been dampened by his responsibilities. When you approach Les Îles, time becomes suspended. On Les Îles, you don't get time from a clock. You take whatever time you please. There's no hurry. It's the wind that sets the pace and it usually has the last word. Les Îles are my country, my land. They are life itself. Captain Bernard Langford is as human and approachable as he is competent and rigorous. And he will always return to Les Îles, his home port. Although he spends a lot of time on the sea, there is never any doubt in his mind that Les Îles are his homeland. Nothing can replace that. Each time he sets course for Les Îles, he is heading home.